Losing to MK Dons on Saturday has put paid to Forest Green Rovers' chances of automatic promotion, according to their manager Mark Cooper. 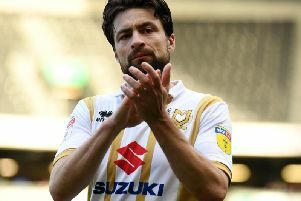 Russell Martin's strike with four minutes to go ensured Paul Tisdale's men took all three points at The New Lawn in the 2-1 win, moving Dons up to second in the table. With six games remaining, Forest Green are now 10 points adrift of Bury in the final automatic promotion spot - who have a game in hand - with Cooper resigned to a play-off spot at the very most this season now. “We could win six games, but I think automatics are too much,” admitted Cooper. “We just have to concentrate on winning as many games as we can and look forward to Crawley on Saturday, today has gone – we probably deserved a point, but we didn’t get it. “We didn’t get the basics right today, but we were still in with a chance of getting a point without playing well, but when you get that close to a point - and we are looking for a little bit of character - and I’m looking for the experienced players to see it out, but it was too easy - a cross in the box and a free shot for the second.